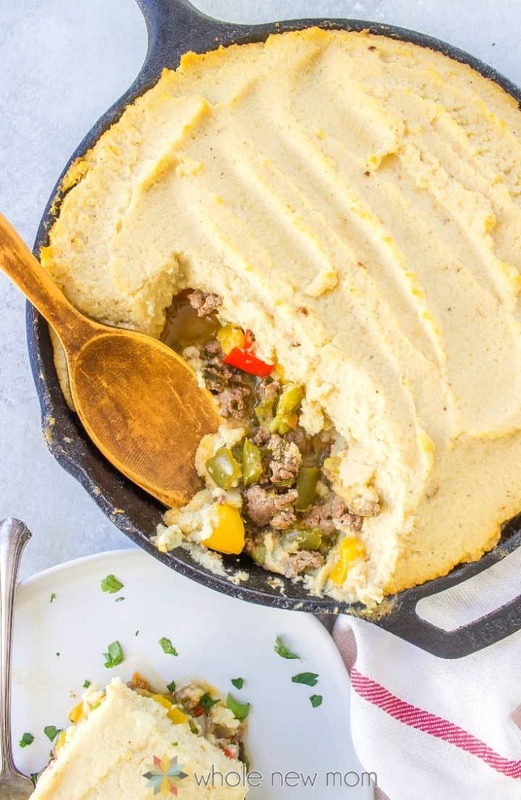 This Paleo Shepherd's Pie Recipe is loaded with nutritious roasted veggies and topped with a savory cauliflower topping, making it a fantastic low-carb alternative to traditional Shepherd's Pie. 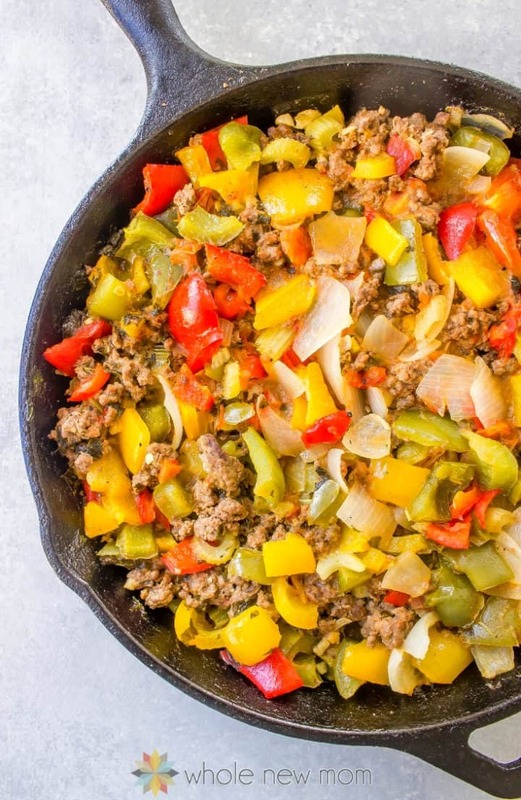 This is a great one pan meal with rich flavor you're sure to love and it's adaptable to almost any special diet. Finding recipes that are kid-friendly and also healthy can be a challenge. If you have kids, you know how helpful it is to have easy healthy meals that everyone in the family can enjoy so that you aren't needing to or tempted to make multiple meals every night. 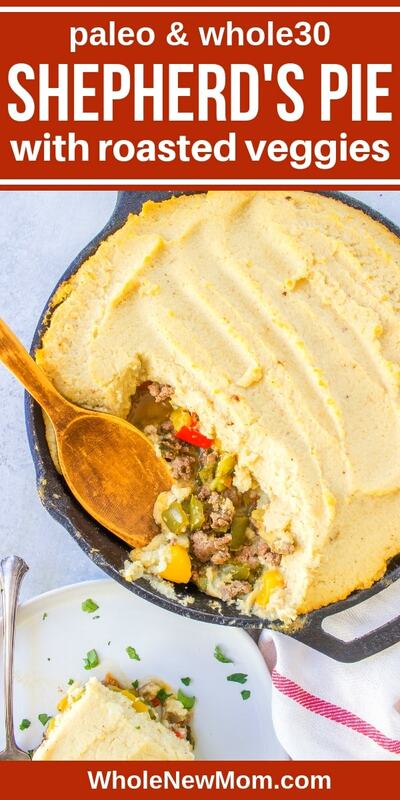 Some of our family favorites that I have shared on the blog include this Pakistani Kima, Gluten-free Chili Mac, Baked Chicken Nuggets, and this healthy Egg Roll in a Bowl, but this recipe for Low-Carb Shepherd's Pie Recipe, is sure to become another one that we really love. 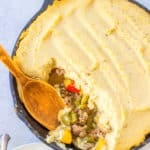 This shepherd's pie recipe is the creation of a healthy-living blogger friend who used to contribute here, Candace from Candida-free Candee. She created some other great recipes on this site like Key Lime Popsicles, Garlic & Chive Vegan Cheese, and these fantastic Homemade Gummies. I'm so glad she shared this recipe with us–I just LOVE the added touch of the roasted veggies to bring extra flavor to an already delicious comforting meal. Truth is, we Shepherd's Pie so much so that I have two versions on my site. I have a Vegan Adzuki Bean Shepherd's Pie Recipe on my site already (my apologies for the not-so-great photo in advance–I will get to them soon) but I really do love Candace's twist on this traditional recipe. Shepherd's pie typically is topped with mashed potatoes, which, while totally yummy, is a little heavy on the carbs for those of us watching our carb intake. 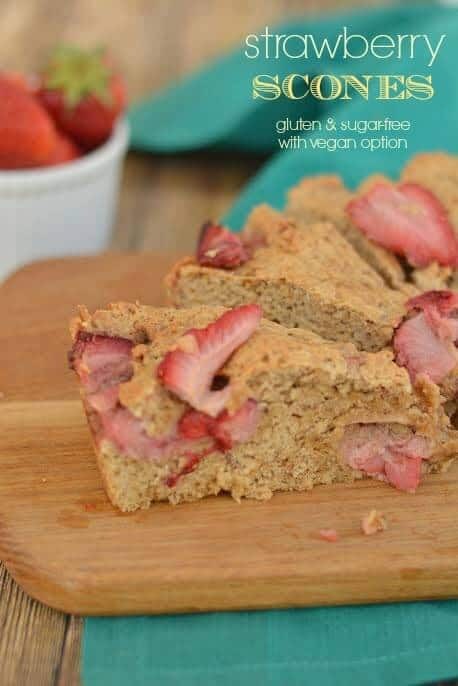 However, whether or not you are watching your carbs, you will love this reduced-carb version for sure. I like to prepare meals ahead of time whenever possible so when things are busier I don’t have to spend so much time in the kitchen. This low-carb shepherd's pie is a great make ahead dish to add to your family's recipe box. You can chop and roast the vegetables and even cook the cauliflower ahead of time, making meal time easy peasy. Where Did the Name Shepherd's Pie Come From? Here is some of the history of one of Ireland’s most beloved dishes. Shepherd’s Pie first came about some time in the late 1700s and early 1800s. Housewives back then were on the frugal side and as such, they were looking for ways to incorporate leftovers into a meal so as not to waste any food. Reusing leftovers was hard then as it is now, however, the shepherd's pie is the delicious result of a frugal necessity. Recipes for shepherd's pie vary quite a bit, but they are all fundamentally the same. There’s a crust of mashed potatoes on the top and bottom and inside there is minced meat. Cottage Pie is similar and uses beef while a Shepherd’s Pie uses lamb or mutton. In that sense, this recipe for Paleo Shepherd's Pie is truly a Cottage Pie, but I'm not telling :). In more ways than one, this is not your typical shepherd’s pie. This particular creation is full of roasted veggies (so it helps you up your vegetable intake) plus it is a great meal for those who are trying to remove grains and starches either completely or partially from their diets. Shepherd’s pie is a great winter comfort food, it is so warm and filling, however, it can be a little bland at times so the additional veggies & the roasting really help to mix things up. Adding roasted veggies to the filling was an easy choice to add more flavor. Roasting is so quick and adds so much to dishes. In fact, once you've roasted a few veggies, you're sure to want to roast everything! To make traditional shepherd's pie low carb, you simply ditch the potatoes and use cauliflower for the topping. Most likely if you've been eating low carb, or on the AIP diet, you've seen cauliflower used as a substitution in many recipes–for Pizza Crusts, or as an alternative for potatoes like in this Faux-tato Salad. However, in this recipe, I'm doing something different with the cauliflower to make it even better. 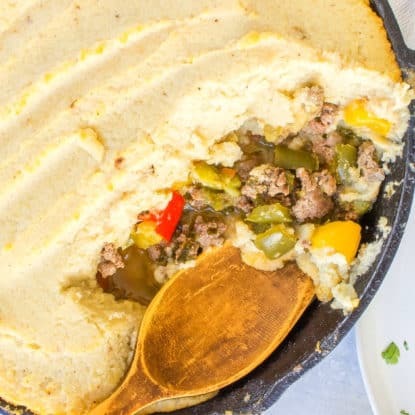 Even if you're not a cauliflower lover, or have tried cauliflower mash or cauliflower rice and haven't been a fan, try this recipe since in this recipe it's not only the veggies in the Low-carb Shepherd's Pie that are roasted, but the cauliflower is too! Roasting this white cruciferous veggie adds SO much flavor; you really must try it. Even cauliflower haters will be clamoring for more. Additionally, for more flavor, the cauliflower topping also includes nutritional yeast. 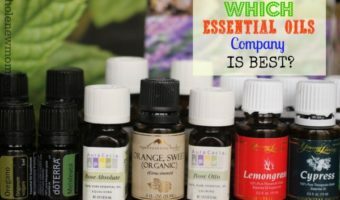 This is a bit of a controversial topic, but even if you are suffering from candida, never fear. This yeast is deactivated and non-pathogenic and does not feed candida. However, some practitioners say that if you are dealing with a very severe case of candida of candida, then it's possible that nutritional yeast might be something to avoid. At the same times, the word “yeast” still freaks some people out a bit, so that's the case with you, and you are feeling cautious, just leave it out. The cauliflower is pretty delicious on it’s own. This Whole30 Shepherd's Pie recipe is a time saver. Roast veggies for a few recipes at a time you can really minimize time spent in the kitchen. While the components of this recipe take a few extra steps I think you will agree that it is well worth it. For extra time saving make a couple of these pies, pop them in the freezer, and heat them up on a cold day! Garlic Tip: See Easiest Way to Peel Garlic for a great tip on peeling garlic. Vegan Option: If vegan, use about 4 cups of your bean of choice for the meat, but de gas the beans first. Kombucha Vinegar: The original recipe called for kombucha vinegar instead of apple cider vinegar, so you can use kombucha vinegar if you like, but it is very hard to find. You can of course make it yourself. Bone Broth Options: Here are some tips on how to make bone broth. Also, you can use this Vegetable Broth Mix for a vegan version. If you'd prefer to buy bone broth instead of making your own, here is a great place to do so. 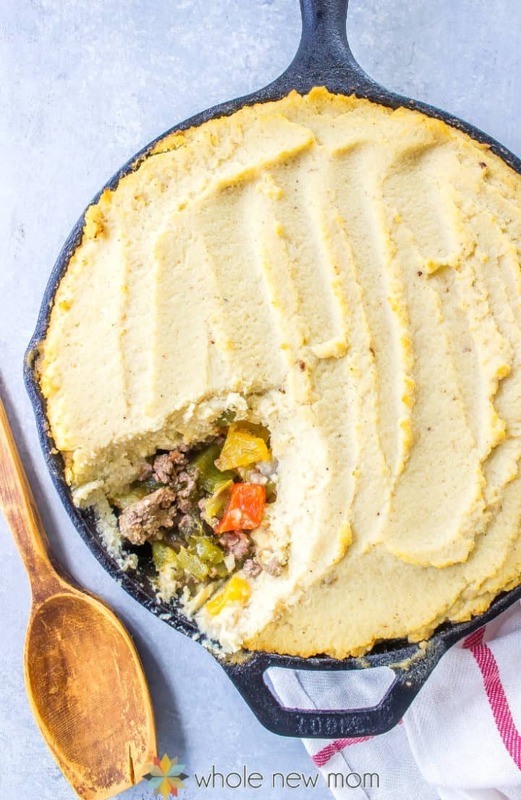 This Paleo Shepherd's Pie Recipe is loaded with yummy roasted veggies and topped with a delectable savory cauliflower topping. Take chopped cauliflower and toss it in a large bowl with 1-2 tbsp extra virgin olive oil. Add in nutritional yeast (if using) and salt. Toss to coat. In another bowl, toss the tomatoes, onion, and peppers in a tbsp of extra virgin olive oil, salt and freshly ground pepper. Once oven is heated, take out baking sheets and line with parchment paper, if desired. Place in an even layer the cauliflower on one sheet and the rest of the veggies on the other. Bake until nicely roasted, about 20-25 minutes. While baking, saute garlic in extra virgin olive oil over medium heat. Add celery and cook until slightly softened. Add in beef and brown, adding salt and pepper to taste. Once veggies are done, remove them (except for cauliflower) from their baking sheets and add to the beef mixture. Pour in broth and vinegar and simmer until cooked down slightly. Stir in parsley. While mixture is cooking down, place the cauliflower in a high-powered blender (I used my Vitamix) or food processor and puree. You may need to add more yeast or salt at this point. Divide the beef mixture evenly among two 8" pie plates and top with the roasted cauliflower puree. Bake at 375° for 15-25 minutes or until heated and the topping has a golden colour. (colour will be lighter if yeast is omitted). 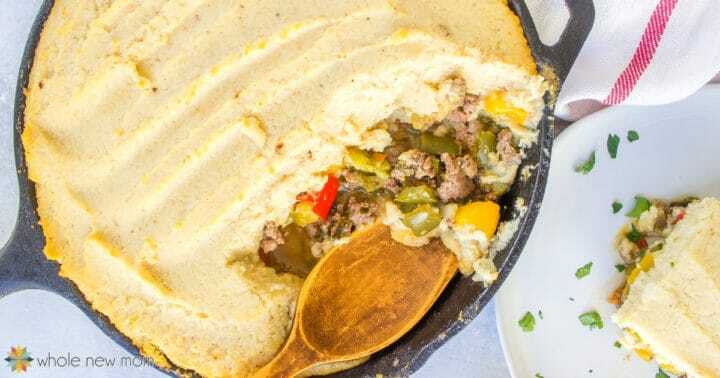 I hope this Paleo Shepherd's Pie Recipe makes its way on to your dinner (or lunch) table soon and I would love to hear how you like it. Let me know what you think about this low-carb shepherd's pie in the comments. This is one of my son’s favorite meals. I’ll have to try your version, it looks delicious! I never thought of adding nutritional yeast to the topping – what a great idea!!! Thank you so much, Cassidy! I hope he likes it done this way! Shepherd’s pie is my brother’s favorite meal. 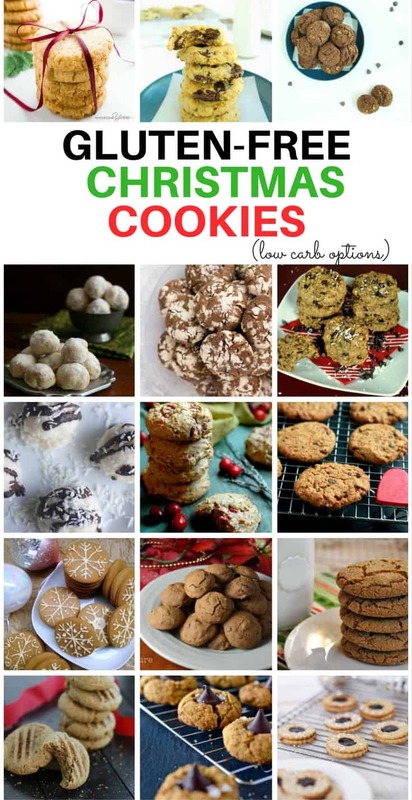 I’ll have to try this recipe when he comes to visit in January. The nutritional yeast in the mashed cauli sounds interesting!